Turtle Art, also known as Turtle Blocks, is an activity with a Logo-inspired graphical “turtle” that draws colorful art based on snap-together visual programming elements. Its “low floor” provides an easy entry point for beginners. It also has “high ceiling” programming, graphics, mathematics, and Computer Science features which will challenge the more adventurous student. Start by clicking on (or dragging) blocks from the Turtle palette. Use multiple blocks to create drawings; as the turtle moves under your control, colorful lines are drawn. You add blocks to your program by clicking on or dragging them from the palette to the main area. You can delete a block by dragging it back onto the palette. 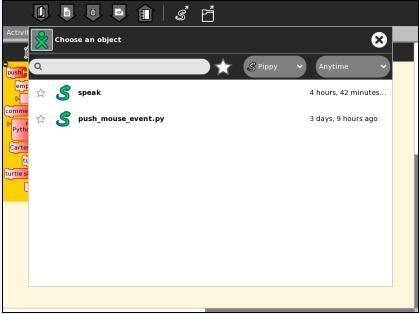 Click anywhere on a “stack” of blocks to start executing that stack or by clicking in the Rabbit (fast) , Turtle (slow) or Bug (debug) buttons on the Project Toolbar. Find some interesting Turtle Art tutorials. Try some interesting Turtle Art challenges. Keyboard short cuts for the above: Alt+ palette; blocks; run; walk; stop; erase; e.g., Alt+e will erase the screen. Esc will return from full-screen mode. Notes: The run buttons are tied to the Start Block. If no Start Block is used, then all blocks are run when either run button is clicked. The “rabbit” button runs the blocks at maximum speed. 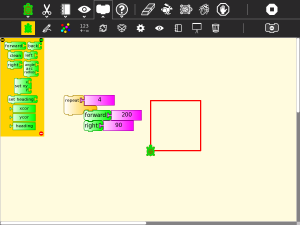 The “snail” button pauses and displays the turtle and block values between each step. Share blocks; shown in disable state. Used to share stacks of blocks between collaborators. On older Sugar systems, these controls appear on the Import/Export toolbar. On smaller screens, the load/save buttons are shown on a palette. To share a stack, click on the share button. The cursor will change to the hand shape Ta-hand-cursor.png. Place the cursor on any block or stack of blocks and click. The blocks will be shared and the cursor will change back to the arrow shape. 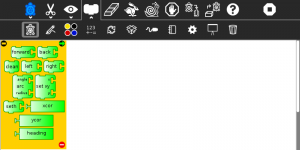 The Edit toolbar is used to copy stacks of blocks to the clipboard and to paste stacks from the clipboard. To copy a stack, click on the copy button or type Ctrl-c. The cursor will change to the hand shape Ta-hand-cursor.png. Place the cursor on any block or stack of blocks and click. The blocks will be copied to the Sugar clipboard and the cursor will change back to the arrow shape. To paste from the clipboard, type Ctrl-v or click the paste button. There are ten palettes of program elements available for program construction: Turtle movements; Pen attributes; Color attributes; Numeric operators; Logical operators; Logical blocks; Sensor blocks; Media blocks; Customization functions; and Presentation blocks. An eleventh palette is used for restoring blocks from the trash. Note: Additional palettes may be loaded by plugin extensions to Turtle Blocks. The button, which replaces the Stop button on the main toolbar while the program is executing, is used to reveal the program blocks. Individual palettes can be hidden by clicking on their highlighted tab. These blocks are used to control the movements of the turtle. These blocks are used to control the attributes of the turtle’s pen. These blocks can be used with the set-pen-color block in place of a number block. These blocks are arithmetic and boolean operators. These blocks control program flow. Note: Nesting while and/or until blocks is not always reliable. If you encounter an error, try putting the nested block in a separate stack, accessed with an action block. These blocks are for defining variables and subroutines. Note: When a named action or named box block are used, new blocks appear on the palette that correspond to these names; e.g., if a top of action stack is rename, “to square”, an action block, “to square” is added to the palette. The OLPC XO 1.75 also includes an accelerometer. See Using Turtle Art Sensors for more details about the sensor blocks. These are a collection of blocks used for displaying media objects, such as images from the Journal. These are a collection of extra blocks for accessing advanced features only available in Turtle Blocks. turtle shell: import a image from the Journal to use as the turtle’s ‘shell’, i.e., replace the turtle with a sprite. These blocks are used to make multimedia presentations only available in Turtle Blocks. Note: The slide blocks expand into stacks that can be edited for customized presentations. This palette holds any blocks that have been put in the trash. You can drag blocks out of the trash to restore them. The trash palette is emptied when you quit Turtle Art. An example of a vertical palette. Vertical palettes are used by default on the OLPC XO laptops running older versions of Sugar. Tony Forster and Mokurai have created a number of Activities/Turtle Art/Tutorials Turtle Art Tutorials on a wide range of math, programming, art, and Computer Science topics. There is also a substantial literature of educational materials using the Logo programming language, from which Turtle Art and Turtle Blocks derive. The Exploring with Logo series from MIT Press is particularly recommended for showing how far beyond simple graphics Logo can go. Mokurai recommends starting with his first three, specifically designed for helping beginners of all ages, starting with the preliterate in preschool. You be the Turtle without the computer. Mathematics and art, an introduction to TA. There are versions of Turtle Art in several programming languages and environments, including Logo, Python, Smalltalk, and others. Turtle Art can export programs in Logo, as explained below. There are programmable blocks in Turtle Art which make it possible to include any Python program within the Turtle Art world. The simplest case is a single function call used in a graphing program, but there is no inherent limit on what capabilities of Python one can add to TA. 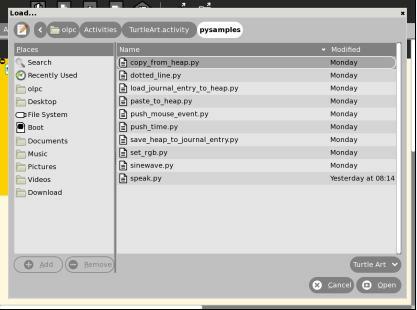 There are two ways to create Python blocks: by loading sample code provided with Turtle Art or by loading Python code the your Journal. A number of individual sample programs are provided. 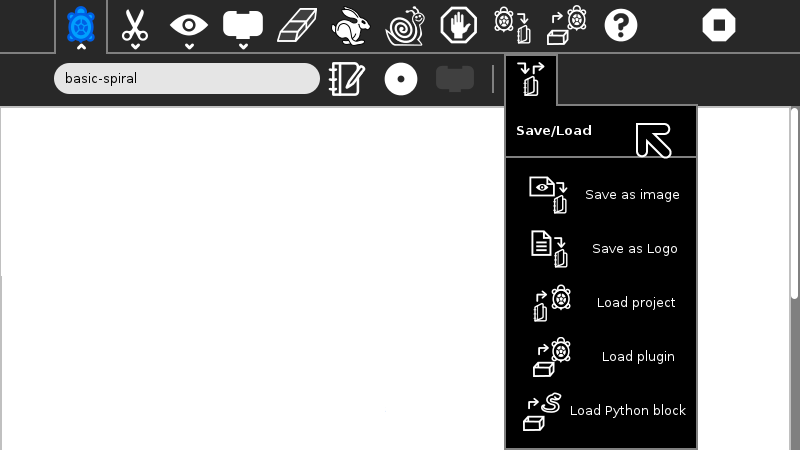 Clicking on the Load Python Block button on the Load/Save Toolbar will invoke a file-selector dialog. Select the sample that you want and it will be both copied to the Journal and loaded into a Python block. Clicking on a Python block that has been dragged onto the canvas from the Extras palette will invoke an object-selector dialog. Select the Python code that that you want and that code will be loaded into the selected block. You can’t run a Python block by clicking on it, as that opens the object selector; instead attach the block to another one and click elsewhere on the stack you have created. Which ever way you create them, multiple Python blocks can have different code loaded in them. Turtle Art is under the MIT license. You are free to use it and learn with it. You are also encourage to modify it to suit your needs or just for a further opportunity to learn. Much of the motivation behind the Version 83 refactoring of the code was to make it easier for you to make changes. Most changes can be confined to two modules: taconstants.py and talogo.py. The former defines the blocks and palettes; the latter defines what code is executed by a block. For example, if we want to add a new turtle command, ‘uturn’, we’d use the add_block method in the Palette class. Next, you need to define what your block will do. def_prim takes 3 arguments: the primitive name, the number of arguments—0 in this case—and the function to call—in this case, the canvas.seth function to set the heading. That’s it. When you next run Turtle Art, you will have a ‘uturn’ block on the ‘mypalette’ palette. Please file bug reports here. Alan Jhonn Aguiar Schwyn and the Butia Team have provided great feedback and many patches.